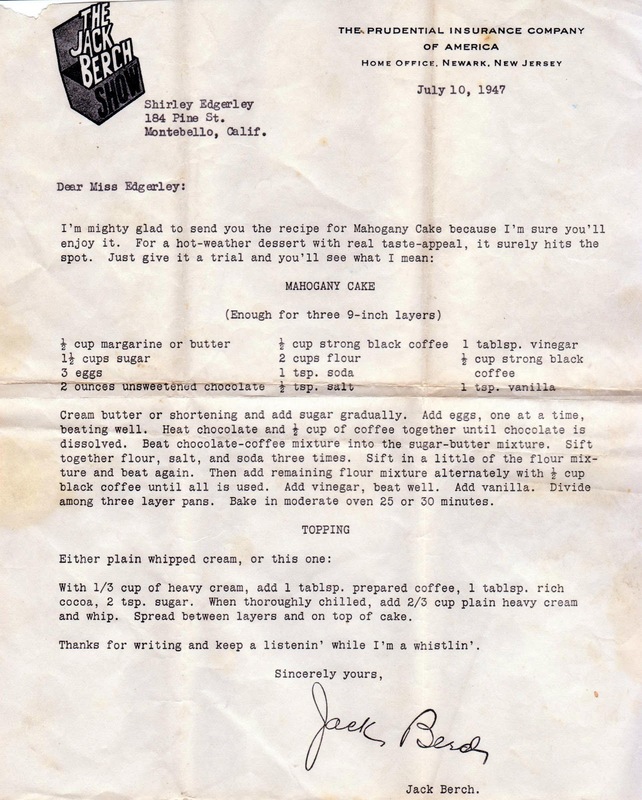 So you can imagine my delight when in a newly arrived recipe box, I discovered this mahogany cake recipe typed in a real letter (remember those?) from old-time radio host Jack Berch, who chatted, whistled and sang for audiences from 1935 to 1954. "Keep a listenin' while I'm a whistlin" was his motto. The show was sponsored by Prudential Insurance and I'm not sure if it was aired nationwide or only in California. I have all manner of mahogany cake recipes in my collection -- and I'm still not sure what distinguishes it from a chocolate one. Most, but not all, have coffee as an ingredient, and some include a small amount of vinegar (which I hope has some purpose other than to make the batter a lighter shade of brown). This is an easy batter to put together and can be baked in two pans, as opposed to three which is what the recipe specified. Please grease and flour the pans, crucial step omitted in the instructions. 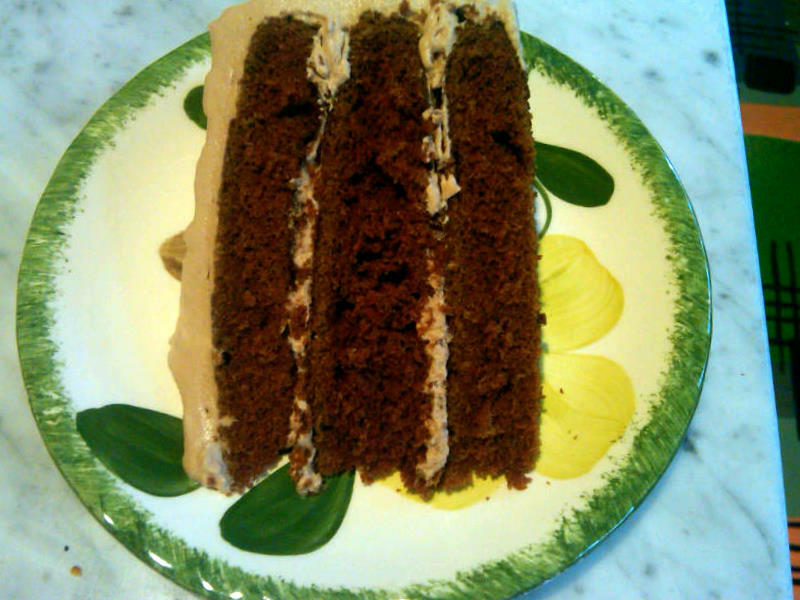 I made this cake for DS who lobbied for a chocolate cake (when I wanted to make a white one). At the end, he didn't care for this cake calling it simply "round," and he described the frosting "whipped cream nastiness." So in this case, the apple did fall far from the tree. Old-time radio still has its fans. Below is a Jack Berch album on eBay at the moment. And while I do enjoy listening to Danny Stiles, it's Saturday night and I'm headed out with the DH. Happy baking to all. What temperature is this to bake at??? When in doubt, or when instructions are missing, I bake everything at 350. Test for doneness by inserting a toothpick in the center. It should come out clean. 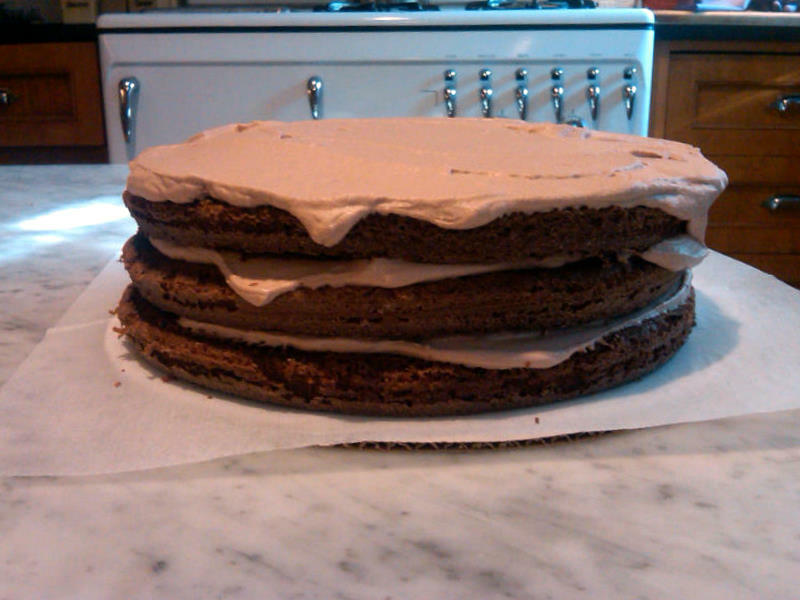 Another way to tell is when the cake just starts to pull away from the sides of the pan. Happy baking! Thank you for the reply. One more question. Does the sugar say 1 1/2 cups or 1 1/8 cups. It is hard to read? It's 1 1/2 cups. Good luck! To answer your comment about the vinegar -- it would have been used to "activate" the baking soda, making the cake a bit lighter. 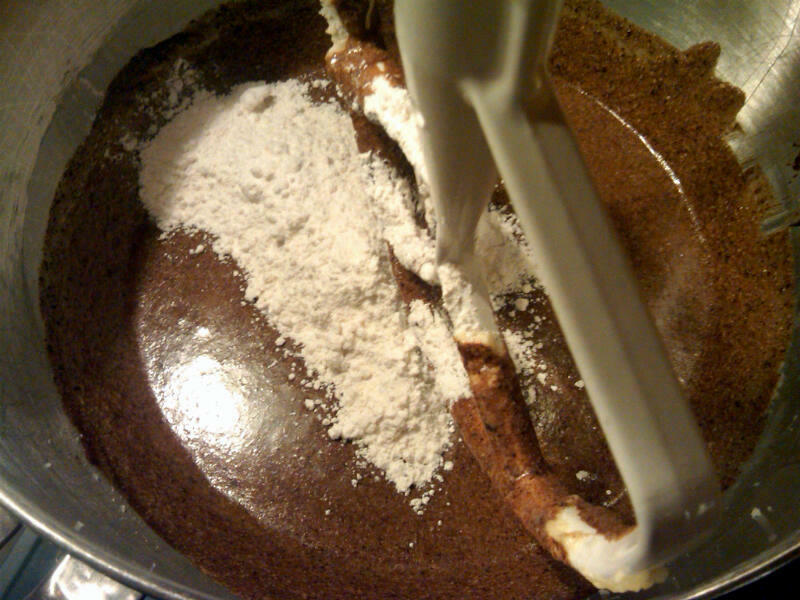 If you use a high-quality natural cocoa powder (not dutch process), the vinegar will also cause it to turn a reddish color -- which is probably the root of the "mahogany" in the name of the cake. 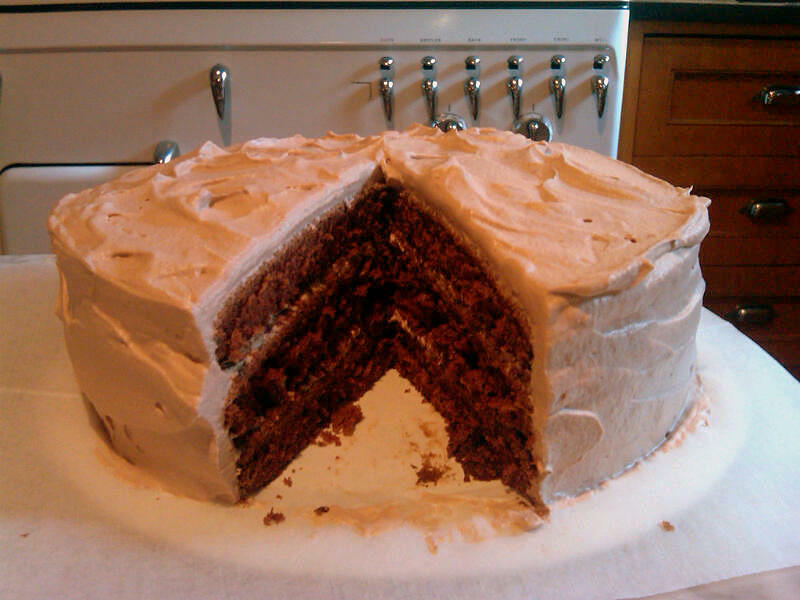 Some folks claim this is the original version of the now popular Red Velvet cake.